HP today refreshed the lineup of its premium laptops series in India with the launch of the new Spectre Folio and Spectre x360 13. The Spectre Folio is said to be the world’s first convertible laptop with a leather body, while the Spectre x360 13 flaunts a sleek metallic body with a 360-degree rotatable hinge. Both the laptops are powered by powerful hardware, such as the 8th Gen Intel processor. The Spectre Folio comes in just one configuration, while the Spectre x360 13 can be picked up in two variants. 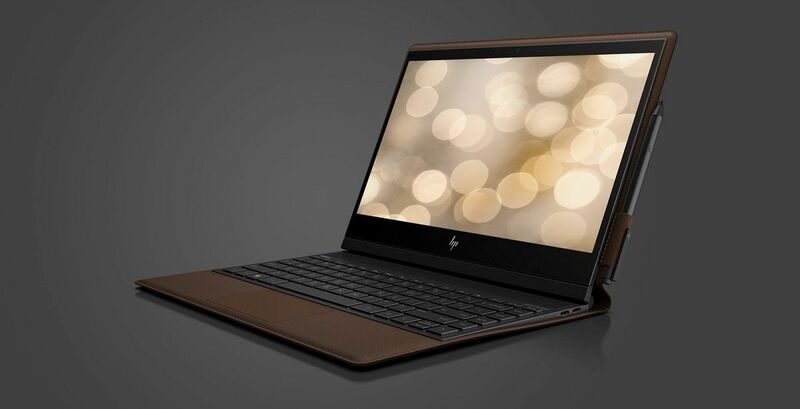 HP has priced the Spectre Folio at Rs 1,99,990 in India; it comes in Cognac Brown hue. The Spectre x360, on the other hand, will set you back to Rs 1,29,990 for the Dark Ash Grey variant, while the starting price for the Poseidon Blue option is Rs 1,39,990. HP equips the notebook with 16GB of RAM and up to 1TB of PCIe NVMe SSD storage. Connectivity options include 2x Thunderbolt 3 ports, a USB Type-C 3.1 port, a SD card reader, and a 3.5mm headphone jack. The connectivity features on the laptop are Bluetooth 4.2 and 2×2 Wi-Fi 802.11b/g/n/ac. It comes pre-loaded with Windows 10 Pro out of the box. The battery is touted to last up to 18 hours with a single charge. The HP Spectre x360 13 is also a convertible PC with 13.3-inch full-HD (1920 x 1080 pixels) touch-sensitive WLED display. The screen can go to 300nits brightness level and has Corning Gorilla Glass NBT. The vendor offers the notebook in two memory configurations and CPUs options. The base model employs 8th Gen Intel Core i5-8265U processor coupled with 8GB of DDR4 RAM and 256GB of NVMe PCIe SSD storage, while top-model rocks 8th Gen Intel Core i7-8565U processor paired with 16GB of RAM and 512GB of NVMe PCIe SSD storage. The wired and wireless connectivity options on the HP Spectre x360 are more and less the same as that of its sibling. Powering the laptop is a 4-cell, 61Wh Li-ion battery, and on the software side of things, it runs Windows 10 Pro out of the box.